The 5th July marks the 70th anniversary of the establishment of the National Health Service (NHS) in Wales and England. Launched in 1948 the aim of the NHS, as set out in the National Health Service Act of 1946, was to promote ‘a comprehensive health service designed to secure improvement in the physical and mental health of the people of England and Wales and the prevention, diagnosis and treatment of illness’. The establishment of the NHS brought about many changes in the systems of health care. The records held in the North Wales Hospital collection document the handover of the hospital to the NHS, and provide an insight into the impact the new service had on the hospital. The exterior of the hospital in 1948, photograph by Ronald Thompson. From its opening in 1848 the North Wales Hospital was managed by a Committee of Visitors, made up of representatives from each of the five counties who financed the hospital. 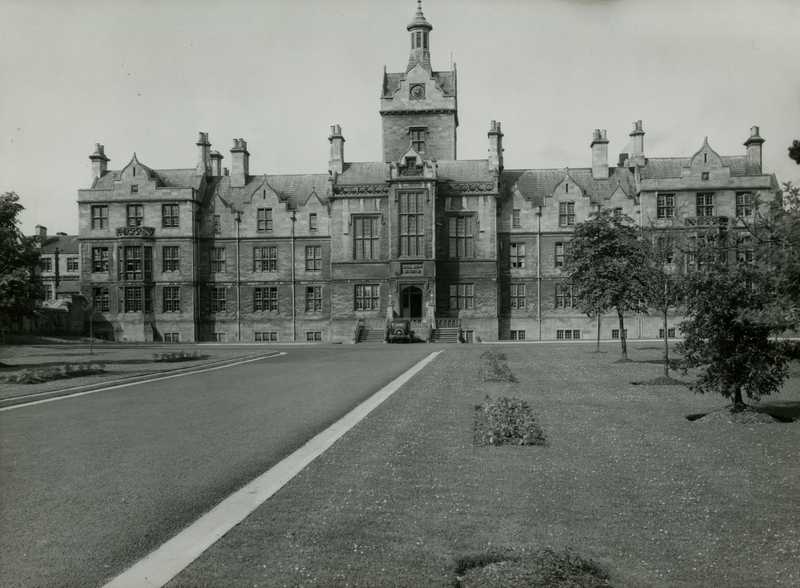 In 1948 the Committee of Visitors was disbanded and responsibility for the management of the hospital passed to the newly created Hospital Management Committee, whose members were appointed by the Welsh Regional Hospitals Board. At the final meeting of the Committee of Visitors, which took place on 21st June 1948, its Chairman, Mr Alfred Hughes said “the committee could rejoice in the fact that they were handing over a hospital they were really proud of – one which the Ministry of Health had the previous week described as one of the best of its kind”. Eight of the members from the former Committee of Visitors were elected to serve on the new committee, in order to ensure stability and consistency during a time of change. As well as the North Wales Hospital the new Hospital Management Committee was given the responsibility of managing the ‘Mental Deficiency’ Institutions of Coed Du, Broughton, Llwyn View in Dolgellau, Fronfraith and later Garth Angharad and Oakwood Park. 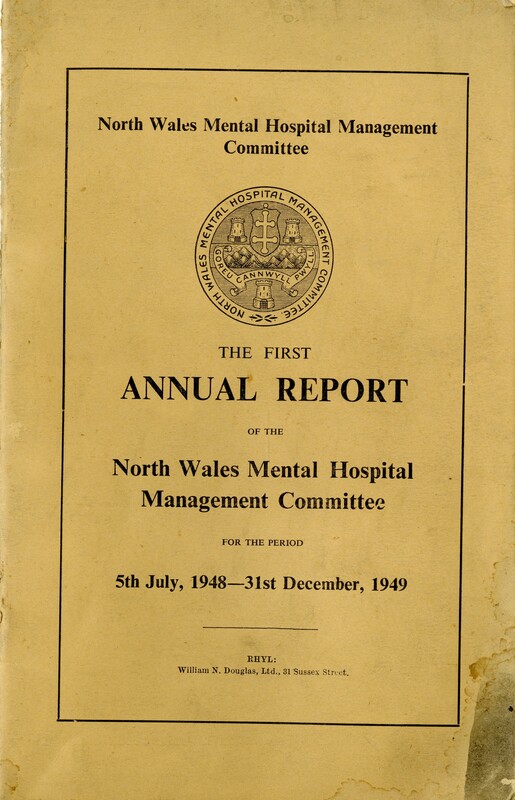 The first annual report of the new Hospital Management Committee, dated 1948 to 1949. The establishment of the NHS centralised responsibility for the management of the hospital. Although the new Hospital Management Committee was allowed a degree of autonomy it was subject to regulations from the Minister of Health, and Regional Hospitals Board, with financial budgets now being decided by central government. This entry was posted on July 4, 2018 at 9:45 am and is filed under Uncategorized. You can follow any responses to this entry through the RSS 2.0 feed. You can leave a response, or trackback from your own site.